Enjoy this fabulous home built in the 1930’s. One of our most cherished Santa Fe properties, this home is professionally decorated with original art throughout. 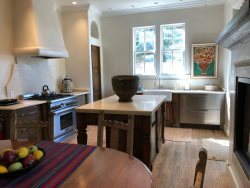 The location is on a quiet street in the well sought after neighborhood of the South Capitol and is perfect for all types of Santa Fe vacations. The property sleeps eight guests. The main home offers two bedrooms and two baths. The downstairs suite has a gas fireplace and full bath which is accessed through the patio. In addition, there is a private detached casita suite with another bedroom, sitting area and bath. The open kitchen dining room is equipped with top of the line stainless steel appliances (no microwave); two door drawer refrigerator and an under-the-counter mini freezer. There is no full size freezer in the kitchen. The bedrooms are beautifully appointed with beautiful and inviting linens and appointments. The garden in this home was featured in the 2011 Botanical garden tour. It is beautiful and professionally maintained; both the front and back yards are wonderful. The courtyard! We also love the kitchen and the separation of bedrooms. We did not have a dog with us this trip, but have in the past and really value that feature. We had a lovely family vacation in the perfect home. You feel a part of Sante Fe...and the coziness of the property means you can enjoy this special place without having to leave the door or garden. Whenever I have called for information I have received prompt and accurate help. This is a fabulous property. The house is beautiful, the neighborhood is charming and the dead-end street is very quiet. We used the courtyard and shaded patios as much as any other portion of the house. This was our second time staying in this property and loved it as much the second time as the first! Everything was very smooth, very efficient. The house and gardens and privacy were just outstanding. Everything was very nicely appointed and decorated. The great kitchen made us happy to stay in more than planned for meals. The town, stores, restaurants were all very convenient. Very very happy experience. Thank you.